Luxury. This is the word that drives us to buy expensive products. The sense of luxury, richness and distinction define designer watches. We aspire to acquire these qualities and in consequence we would do anything to afford an expensive brand timepiece. As money is always an issue these days and we can’t go spending around thousands of dollars on watches, we tend to focus our attention on high quality luxury replicas. Finding these products is not that easy though. It takes a lot of research, patience and comparison until we identify the best stores and knockoffs. 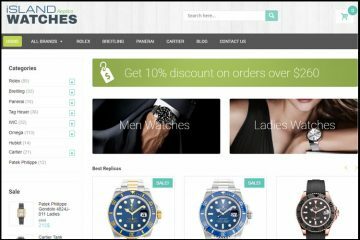 Deluxewristwatch.biz is a lightly designed online store that offers a fresh and airy look which is very friendly and attractive. The layout is pretty simple and intuitive. On the top of the page there is a wide, slim menu bar with buttons to the most important brands, below it there is a sliding medium size banner and a static banner with link to its video channel. In the lower part of the page there are numerous pictures with its sponsored products. 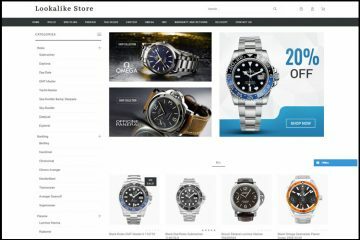 By opting for an easy and fresh design, the store managed to create an elegant and modern looking website where you can comfortably order your favorite replica watch. The company offers a surprisingly large collection of fake timepieces. The Other button from the menu bar is a real amazement. When you move the cursor over it, a drop down list unfolds and it unveils an endless selection of popular designers. 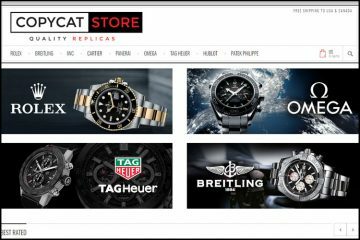 The merchant is one of those e-shops that is keen on impressing its visitors with an extensive selection of best-selling designer watches. The brands aren’t just organized into sub-collections, but also by case size and materials. This makes browsing a lot easier for us. But, wait, there’s more. Because every sub-collection includes hundreds of models there is even an advanced search. This allows you to filter the items by price, case type and bracelet material. Deluxwristwatch.biz carries both Swiss Valjoux automatic movement replica watches and Asian self-winding mechanism fake timepieces. The first category is the priciest one as the items cost about $250 to $400. These watches have the most accurately cloned design and the most accurate and durable movement. The second category is more affordable. The timepieces cost between $100 and $200, and the quality and design are pretty average. If you compare these prices with the ones available on most similar replica watches store you will notice that these meet the market’s average. The product pictures offered by this online shop are of very high quality. The clarity is impressive and you can literally see every small aesthetic detail concerning its watches. Every item has over 20 beautiful and professional photos that display the dial, the case, the buttons, the bezel, the bracelet, clasp and markings. You can see even the small specks of dust. It is clear that the company has invested a lot of time and money into offering these gorgeous photos. The store’s name is watermarked all over the pictures in order to protect them from unauthorized use. It is very important to determine the design accuracy of a replica before you submit the order and when the merchant has very clear images it is really easy to do this. You just take the picture of the fake watch and you compare it with the picture of the authentic timepiece. This is just what we will do with this Rolex Daytona 50th Anniversary. If you look at the images you will be surprised to discover that the dials are identical looking. The same thing goes for the bezel, case and bracelet. I really do not know what to say. Aesthetically, these watches are the same. The only difference is in the materials used for making them. The original one is manufactured from platinum and has a Creachrom bezel while the fake is made from stainless steel and has a regular ceramic bezel. When you add a Japanese watch to the shopping cart the page inquires you whether you prefer it with an Asian movement or with a Swiss one for an extra couple hundred dollars. Only after you confirm your preference you can go further. You also have the option of adding a watch box for $50. Deluxewristwatch.biz offers only deluxe services so do not expect it to provide free delivery. The company can ship packages to any country in the world, but it does this for a shipping fee which varies depending on the selected shipping method. And the options are EMS for $25 shipping charge and an estimated delivery time of 7-10 business days, or Fedex/DHL/UPS for a $45 shipping charge and a 3-5 business days estimated delivery time. Both shipping carriers are equally reliable and professional. The price difference is influenced by the shorter time frame. Do not ignore the payment options provided by a replica watches merchant. This shows how trustworthy and professional a merchant is. The more and varied these payment methods are the more reputable the company is. This merchant appears to be pretty ok from this point of view as it offers the options of paying by Visa, Mastercard, JCB, Western Union, Money Gram and Bank Wire. If you ask me, credit card is the most advisable and secure method as the online transaction is guaranteed and protected by your bank who is always looking out for you. The company is pretty secretive about its refund policy. When it comes to the warranty it tells us that it offers a 6 months free repairs warranty that covers only manufacturing defects and that the shipping back needs to be paid by the customer and the costs of sending the repaired watch will be covered by the company only if it is EMS. If you want Fedex then you need to pay the difference. Regarding the refund, the merchant only says that it offers one, but it does not mention how many days from the delivery you have to return the product. Also, the shipping back fee will be paid by you and there is another 25% restocking fee that needs to be paid…also by you. I just love the fact that on their website there is a live chat button, one that actually works. Needless to say, I have tested it to see how responsive its agents are. Sally answered. I have seen this name at numerous other replica watches store customer service agents. Maybe it is a very popular name in China or maybe it is the same company. Who knows? The thing is that this Sally was just like the other ones. She didn’t understand all my questions or she pretended that she doesn’t. The thing is that in the end I found out what is their refund policy. The customer has 7 days from the delivery to send the watch back if he wants to ask for a full refund. Another way of contacting customer services is by email at [email protected] There is no contact phone number available. I had great expectations from Deluxewristwatch.biz and in many aspects it managed to surprise me. 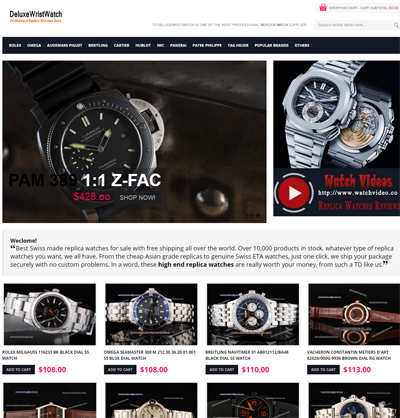 The company has affordable prices, a very wide and diverse selection of replica watches, great product pictures, many payment options and a responsive live chat service. The things that need some improving are the omission of its refund policy, the costly return process and the fact that it doesn’t offer free delivery. 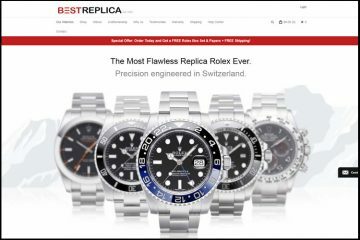 Still, it feels like a pretty decent online replica watches store.